One week after the Melbourne Cup we have our local horse race meeting in Bowral called the Bong Bong Picnic Races. It is really quite a famous gathering and a must to attend on our local social calendar. 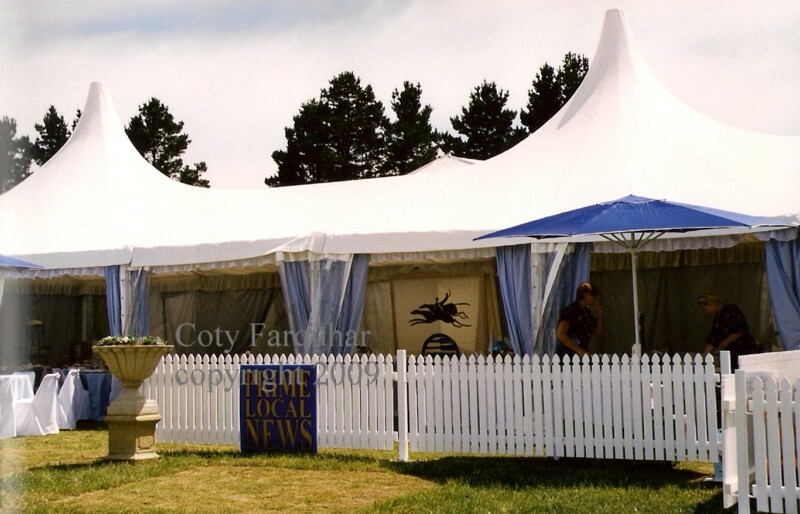 For many years I was commissioned to style and decorate many of the large corporate tents at Bong Bong. 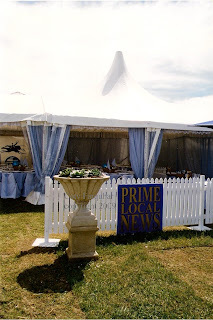 This is just one of my tents for Prime Television that I did a years ago and these photographs were taken early in the morning before all the crowds arrived. Prime Television were the sponsors for the main race and we always had the best position on the field right at the finishing line. After choosing the marquee/Hoecker that I wanted and this one above had two beautiful peaks on the roof top that I loved and it was big enough to hold our guests I then marked out the space and designed the look and decor for that particular year and then I was off and running gathering everything needed for this one day. 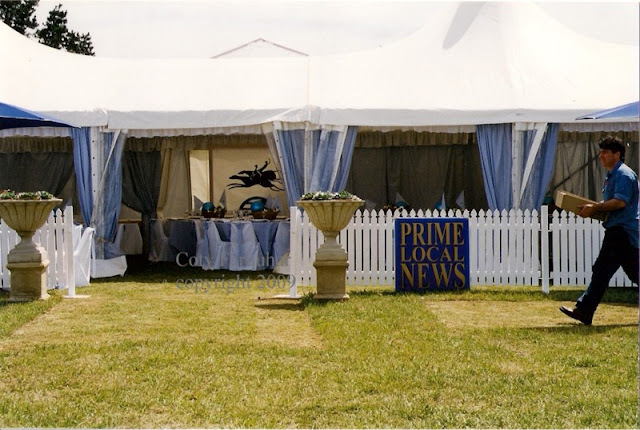 Some years I had a two or three other tents to also decorate as well, but not as large as Prime's marquee. 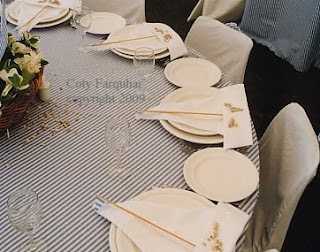 The theme I wanted for this particular year was to be calm and beautiful with soft blues and white stripes. 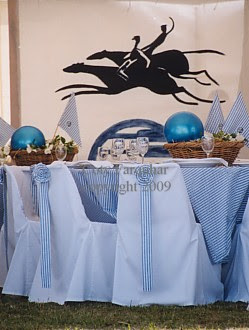 The earlier years I had horse themes with a twist and each year I needed to create something a little different and unexpected for my clients. 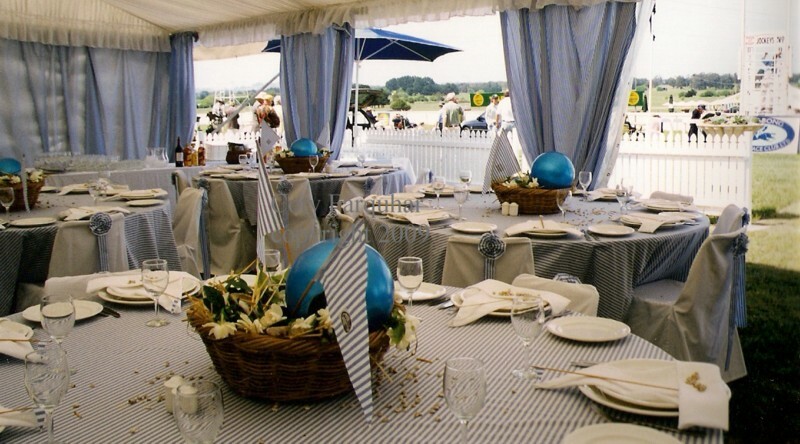 We had over one hundred guests sitting for a delicious catered lunch, afternoon tea and lots of champagne and wine and as you can never predict what the weather will do in Bowral I always choose a tent with clear sides so all the guests were protected in the wind and rain and could still see the race. Over a hundred tents of all sizes are erected all over this race course and it is quite an amazing site. I passed the track yesterday and saw all the tents going up for next week's meeting and I thought I should dig out my old Bong Bong designs to show this week. Andrew and I are not going this year, too many other things to do and work must come first. I always started preparing for Bong Bong months before, it's just like setting up a wedding, weeks and weeks of preparation goes into this one day event. Every single detail is left to me (except the menu and food) and after the design is sorted I start to buy all the materials and gear needed then I start the making of all the tablecloths and preparing all the fine details. 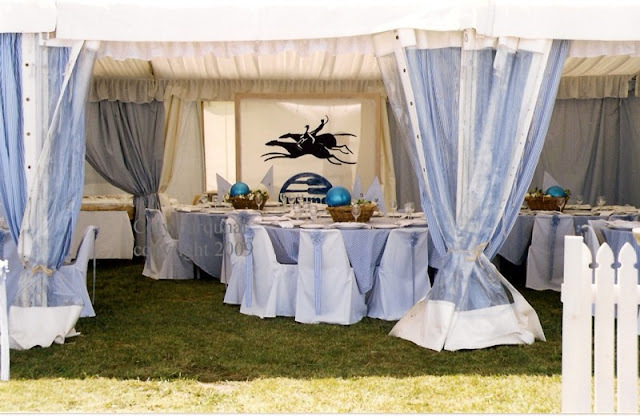 Andrew made me some beautiful screens made from a sheer silk like fabric that I painted my horses racing above my clients logo, these were great as they were both a decorative feature in the tent and seen from far away and I used them to cover the entrance to the catering tent. Nothing worse than seeing into the kitchen. 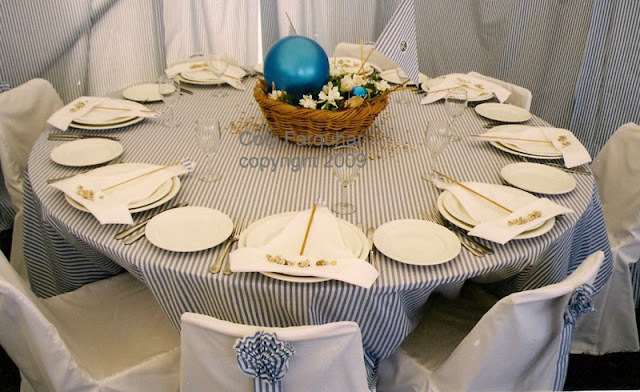 This particular year I covered the entire tent with blue and white cotton sheeting, not wanting plain white walls, I found this gorgeous soft blue and white fabric and used it for everything. 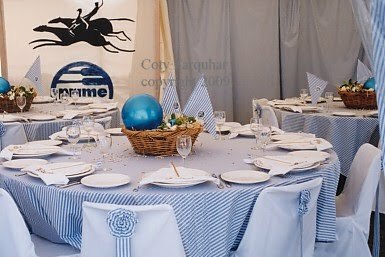 I made fifteen table clothes, lined the walls with the fabric, made little rosettes with ribbons to pin on the back of the chair covers and each guest wore a rosette with little gold stirrups with my clients name as the official badge for this corporate tent. I was the very first decorator ever to change the way corporate tents were decorated at Bong Bong. 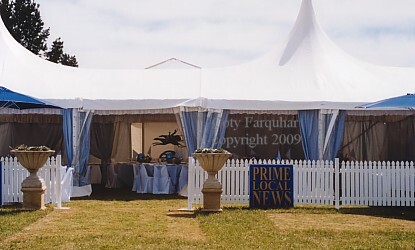 It was fourteen years ago when I created the first tent for Prime Television. 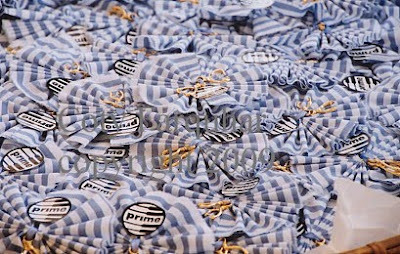 Everyone came to have a look at what I was doing and year after year the corporate tents have since grown, now it is quite a common thing to dress up your tent, it is as important as dressing for the day. 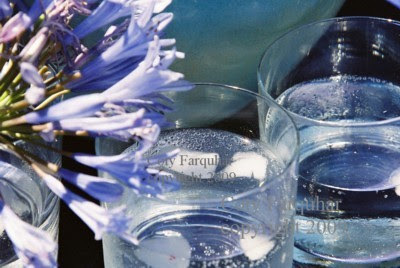 The details above on the table were always important to me, with this blue and white theme came a fresh sea side look, even though we are in the country, I didn't think it mattered. 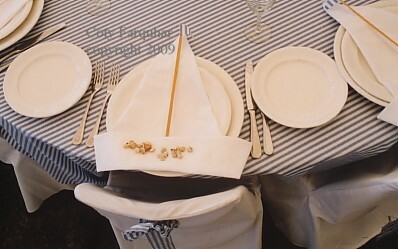 I folded all the white linen napkins in the shape of a boat and I had little sticks with a tiny little flags at the top as the mast and a sprinkling of tiny little sea shells on the bottom of the napkin. I sprinkled the shells around the basket of gardenias that I ordered and were delivered fresh to me that morning from the Sydney Flower Markets. I topped off the display with these gorgeous blue beach balls, why? just because I loved them and they were fun. Each year we mowed the front grass area of our tent for all the high heels and also to just have lovely look. Everyone else had longish grass and this was yet another tradition that we started back then, each year since people started to bring out their lawn mowers in the morning to clear their patch, Bong Bong race course is just a paddock most of the year with cows grazing over the field. Andrew (my other half and personal assistant for Bong Bong) would mow his own wonderful shapes, half circles or amazing pathways into our tent. I have to wonder sometimes who is the stylist! I also bought these two gorgeous pots for the front entrance as well and filled them with succulents, perfect in the full hot sun, and then I hired a white fence to go around the front of the tent. This is my Andrew above rushing into the photo with boxes for me, see the mowed sections on the grass for an added decorative effect. ...and me above finishing off the details very, very early in the morning around 6am before all the guests arrived. 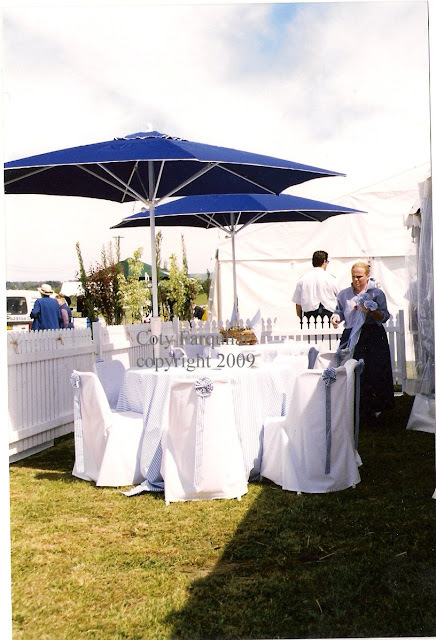 I also bought these blue & white umbrellas especially for the front of the tent, everything had to match of course. Andrew and I would then race home and change into our race clothes, hats and all and head back to the course to meet our friends for lunch. We were often the first to arrive at the track and the last to leave Bong Bong in the evening, it was a very long day, but great fun. Welcome to all from Susan's Tablescape Thursday, if your ever in Australia at this time of the year you really must come to the Bong Bong Race Meeting. So very very lovely -- once again, I would love to live inside your camera! I love the pictures, but I also love the insight into the "behind the scenes" work that you do..you must be exhausted at the end of the day. WEll I want to live inside your head!! This is so beautiful and I love your theme and colours, simple but very effective! You know I've always heard of the Bong Bong races but never been. In fact I haven't been to Bowral for years. Must be time for a visit! I'm so happy to have discovered your blog. You have such and eye for beauty and detail. Thank you for the glimpse through your lens. Fabulous...well done..I know how much work goes into this events!!!! 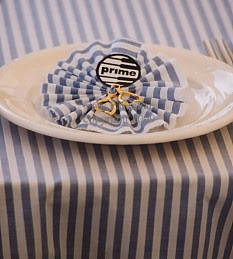 What a treat you gave to Prime's VIP's Coty! The marquee look stunning! The lovely Lisa Porter has been making comments about wanting to travel Down Under soon. 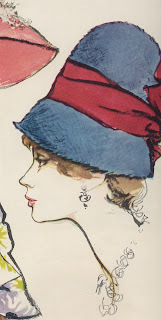 She made an off-the-cuff comment about wanting to catch up with Coty & Millie on the same day. I had to break the news to the darling girl that there was a 14 hr. road trip separating us, & it wouldn't be quite that easy!! Still, won't it be great if she does make the trip, maybe we could all meet half-way! I can't imagine all the planning and work something like this would have taken. It is serene and beautiful!